There’s no shortage of hard drives out there on the market, but that number shrinks significantly when you start looking for drives with specific features. G-Technology’s G-Dock ev is a contender with attributes that you usually don’t find in a storage system: dockable, portable drives; Thunderbolt; RAID configurations; design; and speed. The G-Dock ev is an attractive dual-hard drive bay that ships with two SATA-3 1TB 7200-rpm hard drives. These drives can be formatted to RAID 0 or RAID 1 or JBOD configurations, depending on the user’s preference. G-Technology touts the dock as a perfect solution for working media professionals who quickly need to have a means of storage available to them, both at their workplace and out on the field. With that in mind, G-Technology did a good job. The Dock boasts two large drive-release buttons, which allow for quick and easy swapping of the drives. The casing for both the dock and the drives are made of heavy-duty aluminum, which provides added protection alongside its sleek and elegant design. The drives feel incredibly sturdy when held and slide easily into the Dock, although we did notice some slight scuffing on the bottom of one of the drives after repeated removals. The G-Dock ev ships with a Thunderbolt cable for connecting the dock to a Mac, and also with a USB 3.0 cable in case you want to connect the standalone drive directly into the computer instead of through the dock. The back of the drive bay is equipped with a pair of Thunderbolt ports, enabling the possibility of daisy-chaining of together up to six G-docks. However, paying a premium price for a Thunderbolt-enabled device doesn’t mean that you always get premium level speed. While Thunderbolt is, famously, a very fast connection, it can be hindered by the top speed of the hard drive—exactly the case in this instance. In our tests, we found that the write speed of transferring a 10GB file when using a single drive with the G-Dock ev was 130 MBps, which is nearly identical to the write speed when the standalone drive was directly connected to the computer using USB 3.0, which came in at speeds of 125 MBps. While that’s not a slow number, it’s nowhere near the boost in performance speed that we’ve seen in other Thunderbolt capable drives. The speed increases when both drives are attached to the G-Dock ev and are configured to RAID 0, or striped RAID, which raises the write speeds to 248 MBps and the read speeds to 265 MBps. The striped RAID configuration is the way to go if you’re looking for a lot of significant storage and drive speed, however, there’s a drawback. One of the biggest advantages of the G-Dock ev is that it enables the user to eject the drives, use them separately in the field and then come back and transfer the files back home—something you can’t do with striped RAID drives. Striping the two drives makes it so the two drives can only work when connected together through the dock, thereby taking away this mobility functionality. It’s a tradeoff, and it’s up to the user to decide which of these features are more important. 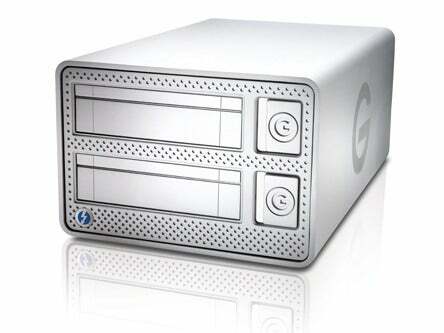 G-Technology plans to tackle this semi-sluggish drive performance in the future with a soon-to-be-released Plus edition of the ev hard drives that they say will be compatible with the G-Dock ev and will reach Thunderbolt-appropriate speeds of 250 MBps when formatted as two separate drives and higher speeds when configured as RAID 0. But, as it currently stands, Thunderbolt speeds on the available G-Dock ev are a little underwhelming. The G-Dock ev is a decent option for someone looking for extra storage space and portability, rather than performance and speed. The G-Dock’s design is attractive, and the ability to use the drives apart from the G-Dock ev as standalones, when not striped together, is a nice feature, but for a $750 price tag we expect a little more performance out of the G-Dock ev. The G-Dock ev features removable drives that can be used as portable hard drives.